Take a trip 5 minutes outside of Brighton on Sunday 31st May and you'll find The Kemptown Street Party in full swing this year. 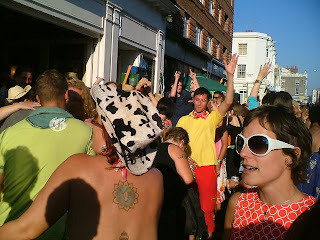 After last years decision by local traders and officials to cancel The Kemptown Carnival which was the bigger of the two events, locals decided to stage an impromptu street party at short notice with the backing of the police and council. As the day/night went off without any problems and everyone enjoyed themselves, it's all happening again. This year St Georges Road will be closed off from midday till 9.30pm with attractions including Live Bands, Street Theater, Brazilian Capoeira, Circus Acts, Samba and Percussion Bands, Stalls, Face Painting plus the UK's largest Burlesque Show. We're hosting the dance sound system in the beer garden at The Thomas Kemp who are putting the whole event on this year, joining in will be Tim from theacidhouse.wordpress.com, Steve K.I.W, Neil Lewis from Disco Libero and Paul Budd/Pablo Contraband. Come along if you're in the area, it's free and happens to be a good day out.